Anya’s first challenge is really an easy one. Normally, this level of complexity would be classed as a “hard challenge”, but the first challenge was chosen by mutual agreement, so I don’t think it should be rated as “hard”. Anya had already expressed an interest in trying to make a pork pie, and so we agreed that this should be her first challenge. Now, let’s be clear here. This one is really a gentle introduction for Anya. Future challenges will be decided by me alone, and she will have no idea what they are until they are posted here. We will, however, start off gently. Pork Pie is a traditional English savoury pie. It consists of chopped, seasoned pork meat in a hot water crust pastry. As it cooks, the meat shrinks away from the pastry walls and the gap is filled with a gelatinous stock which is allowed to set before serving. Traditionally sliced and eaten cold. 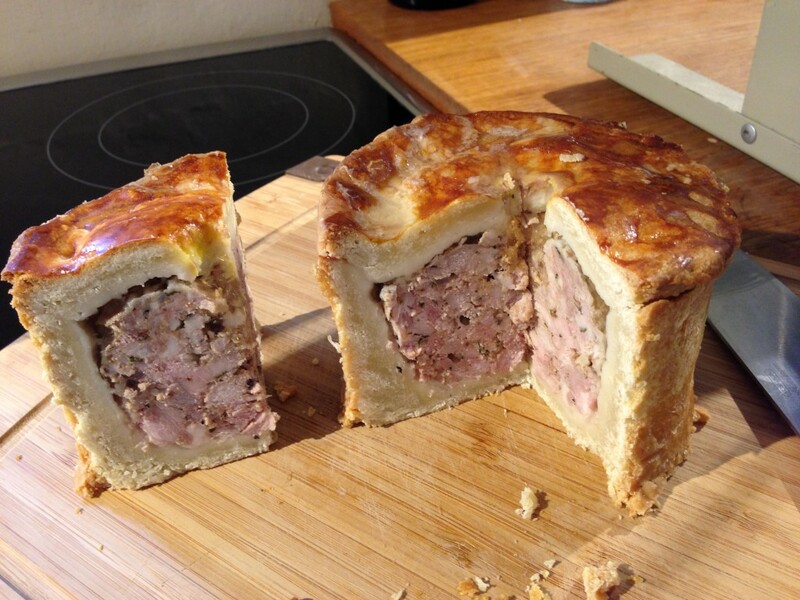 Make a traditional English pork pie, with hot water crust pastry. The pie may be made using a tin or mould, as you prefer.